Matt, loved textpad to blog with. So matt met this guy called mike and they converted b2 to wordpress. Now there are about 23-24 wordcamps all over world now. 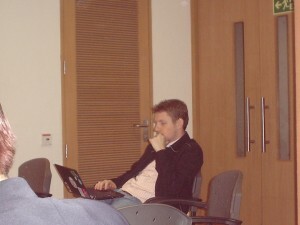 Matt thinks last year was really good for wordpress casue people around the world started to get involved more and more. Average user install around 4.96 plugin. couple of weeks ago wordpress crossed 4000+ plugins and 5000+ themes which are officially listed with wordpress. WordPress also added Built-in update and installers which was also a time saver for matt. alright we have “Hindi” in matt’s presentation, oh what some more bangla, telgu, marathi. So wordpress is healthy enough with regional languages of India. 11,651 blogs are in other regional languages up and working. 15-20 thousand people are testing wordpress 2.8 release. Testing, coding 24 hours, re-iterations, re-designs makes up a new release. Faster, minimize the http,caching trips. Further matt says that one can copy wordpress and make a clonepress but cannot copy the community associated that is we all. When matt started wordpress he was a kid studying political science no computer science at all. How can you help as a community ? Write a tutorial, write some plugins if you know PHP. Make themes if you are a designer. Help people, help community. And there Matt finished his preso. This was live blogging. Stay tuned ! !